We had our first baby- a boy- on a Friday evening in spring of 2010. We were thrilled with how perfect he was, admiring every finger and toe, and gladly took him home after the required two-day stay in the hospital. When he was five days old we woke up to a baby that refused to wake up and eat and had a temperature under 94 degrees farenheit. I remember hurrying out the door knowing we were going to get earth-shattering news. We rushed to the doctor’s office and watched the reaction of the medical staff. It was far from reassuring. While we were at the doctor’s office Micah’s newborn screening came back with an abnormal metabolic reading. I had never heard of newborn screening or metabolic disorders so that didn’t mean much to me but our doctor immediately contacted the closest children’s hospital and our local ER. We rushed our baby to the ER where they attempted to stabilize his temperature while we waited agonizing hours for him to be transported to the children’s hospital. The children’s hospital didn’t give us much hope. They did tell us that they thought he had Isovaleric Acidemia and gave us some paperwork explaining the condition. Then we waited. We waited overnight when they intubated him. His body was struggling to expel the extra acid and it wasn’t working. We waited the next morning while they put him on medication to stabilize his blood pressure. Then a new resident came on shift and called to tell us that she wanted to transfer him to Cincinnati Children’s for further treatment. At this point Micah’s heart was beating on its own but they were assisting everything else. We went back to see Micah one more time before they transported him to CCHMC. I remember standing there crying and looking at my baby. Then I realized that the resident was standing in the corner of the room and she was crying too. Micah was six days old and we were sure we were going to lose him. When we arrived at CCHMC Micah had been there about thirty minutes. There were medical teams waiting on us to approve procedures to perform dialysis to help clean the acid out of his blood. The risks were significant but they had a plan in case things went wrong. They primed the machine with blood since he was too small for the procedure and started dialysis. It took three tries before his ammonia levels stayed level when they stopped the dialysis. We did a lot more waiting. Waiting for him to come out of his coma; his first cries were precious sounds. Waiting for him to get up to full feeds. And then waiting to be discharged. Two days out from our discharge date Micah started throwing up. The next evening I was standing at the foot of his bed watching the monitors when I noticed some discrepancies as the numbers jumped high and then fell down. Micah was having arrhythmias and they had to call in a specialist to get his IV placed again. 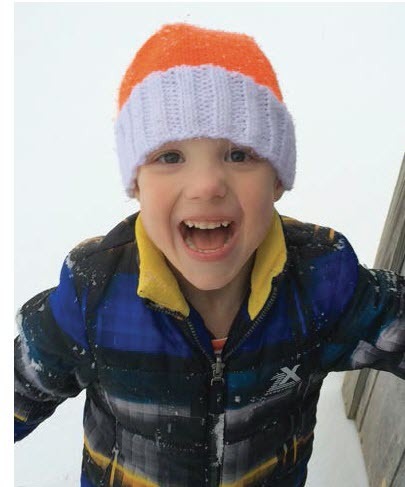 He was diagnosed with pyloric stenosis later that week. When they did the pylormyotomy to correct the pyloric stenosis they also placed a g-tube as a precaution. That g-tube placement was such a blessing to us. Micah had oral issues from his crisis and was able to drink very little of his formula by mouth. For over a year we used the g-tube every time we fed Micah his formula. When he was eighteen months old he started drinking his formula on his own and he loves it now. He’s never had any problem eating solid foods. We continued to use the g-tube occasionally whenever he was ill.
Micah has experienced some delays, mostly speech-related, but he’s making great progress. His g-tube has been out since October and he participates in typical four-year-old activities. He will turn five in April! Micah receives continued care from the great metabolic staff at Cincinnati Children’s Hospital and Medical Center. Along with a reduced protein diet, he continues to consume a formula mix of I-Valex II, carnitine, and glycine on a daily basis.